Licensed games used to have a well-earned reputation for being mostly garbage. The occasional Genesis-version Aladdin or PS2/Xbox Spider-Man was matched by dozens of forgotten titles that were little more than a marketing accessory to a movie, frequently bearing only a cosmetic resemblance to the source material with the story warped or almost completely discarded so something resembling gameplay could be hung off it. The best you could hope for was competency, but even that was a rarity. 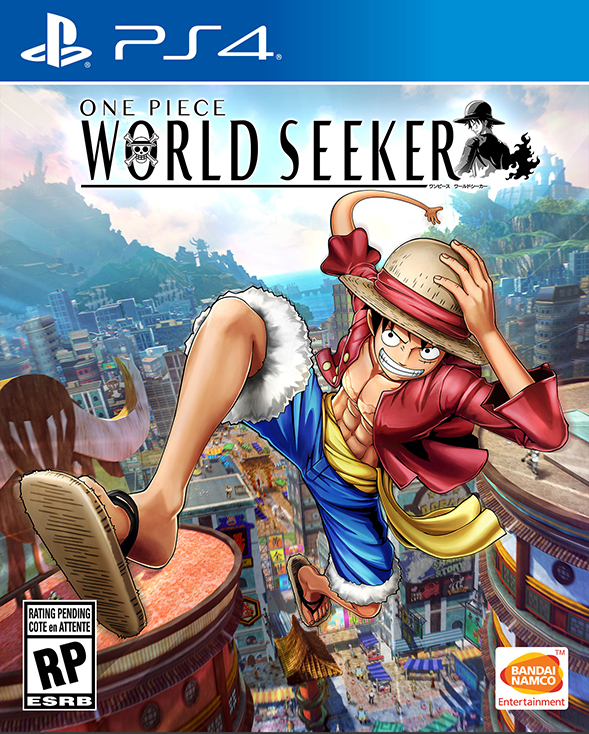 By the standards of the mid-2000s, One Piece World Seeker would be one of those rare licensed titles made worthwhile by its comparative adequacy, but it’s 2019 now and that makes it much harder to recommend. Which by no means means World Seeker is a bad game, as it turns out. Sure, it starts a little slow, with every action including movement locked down until the tutorial text tells you how to do it, but by the time the plot kicks in and the gameplay systems are available, I found I’d accepted the game’s shortcomings and played it for what it is, rather than what I wished it could be. The result is a good-sized adventure that takes you through every point on Jail Island from the landing beach, through villages, fields, and forests, up a mountain and through it’s gem-filled caverns, and even a large city that acts as a giant playground for Luffy to do his best Spider-Man impression through. Just because the game’s ambitions are greater than its ability to deliver on them doesn’t mean the result isn’t any fun. The story starts off with Luffy and the full crew of the Thousand Sunny doing an out-of-character heist on a military base to steal its treasure. Surprise, the vault is empty and it’s a trap! After confronting the cyborg warden of the sky-island base, Luffy is thrown into the ocean hundreds of feet below and then wakes up on the beach of Jail Island having been rescued by Jeanne. While it’s called Jail Island the place isn’t quite so dire as its name implies, instead housing multiple villages where people are living their lives as peacefully as they can manage. Which isn’t particularly peacefully, as it turns out, because the Navy (not the Marines, because the game apparently uses the English dub title for the organization despite all voices being in the original Japanese) has led to a political divide in the populace that’s beginning to get out of hand. The Navy has a large base near Steel City and two huge prisons on either side of the island, and the residents are split fairly evenly between pro-Navy and anti-Navy. This has led to a deep unrest that Jeanne has been trying to keep from exploding into violence, with mixed results. Things are rapidly heating up as cyborg-warden Isaac’s plans are beginning to pay off, leading to an influx of pirates all seeking a piece of a mysterious treasure that Jail Island used to produce from its mines. And then Luffy and crew land right in the middle of it, which means the plans of the island’s multiple factions are about to be voided due to an infusion of good-natured chaos. From the moment you wake up on the beach to the very end of the game you’ll be playing as Luffy, which on the one hand feels like a waste of potential but on the other means every aspect of the game can be tuned to his abilities. 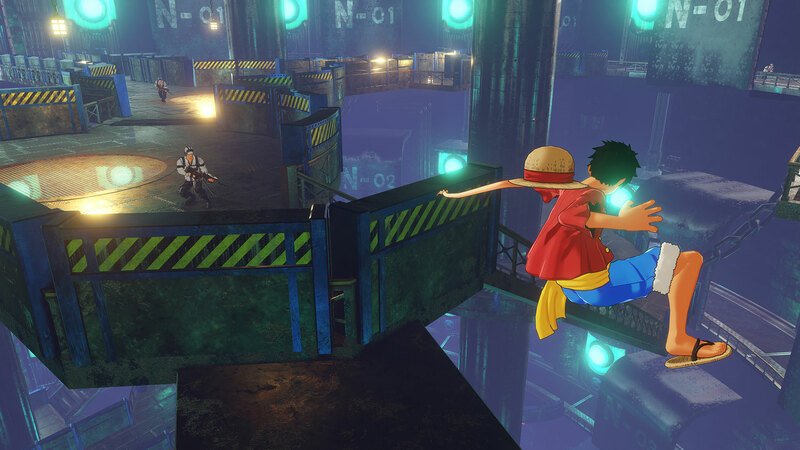 The initial slow start where the game teaches you advanced concepts such as “Hit X to jump” quickly falls behind as Luffy’s rubber powers come into play, used not just for combat but also mobility, letting you zip around the island to your heart’s content. The giant open map is available from the very start, and while you’d probably want to earn a few abilities before wandering off to explore, once you get to Chapter 4: Gathering the Crew, there’s nothing stopping you from poking into every nook and cranny of the well-designed map. 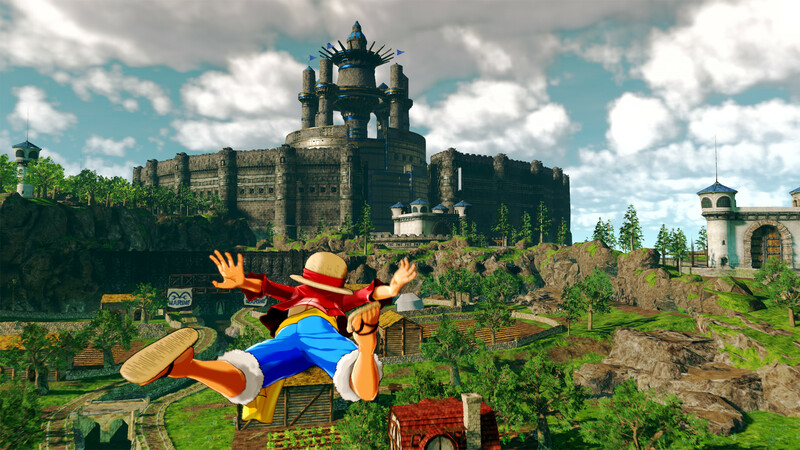 The biggest thing One Piece World Seeker gets right is its exploration. The island is simply fun to run around in, with its different regions all feeling distinct from each other and having goodies tucked away just about everywhere. The mini-map on the lower right of the screen shows the location of glowing spots where you can harvest resources, white for common or scarce items and gold for rare, and each region has a number of treasure chests to chase after as well. The spots regenerate, and while I dutifully chased after them like a rubber-man Pac-Man at the start, I eventually ignored most of the white spots and instead punched crates to keep my resource supplies topped off. The treasure chests, on the other hand, are tallied up on the world map, showing you how many you’ve found out of the total in each area. To make thing a little trickier the mini-map only shows a top-down view that doesn’t indicate where chests are located vertically, and that’s where Luffy’s haki abilities come into play. Haki is basically a mental discipline that gives its users superpowers, roughly broken up into speed, strength and perception. Touching down on the d-pad switches Luffy from the fast-paced Perception haki to the combat-oriented Armament haki, each of which give him a couple of different abilities. In Armament mode Luffy can block damage and let off massive attacks, while Observation mode replaces the block with a dash and he gains a detective vision to use in short bursts. The detective vision picks out enemies in red, townspeople in green, and destructible items and treasure chests in white, which is great for letting you know where a missing treasure chest is hiding while not holding your hand so much that is shows a path for how to get there. While zipping around the world, rocketing from trees and platforms as the landscape flies by below is great fun (and fast travel deeply useful for the times it isn’t), the combat doesn’t fare quite so well. 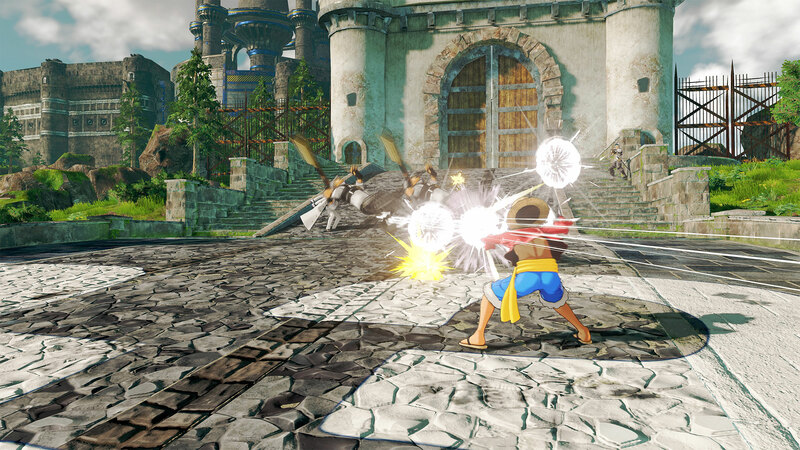 Most of the time you’ll rely on a four-punch combo, hitting the same button over and over until no enemies are left, but as Luffy completes mission and earns skill points he can spend them on new abilities that break up the button-tapping. Using the dodge or block move with perfect timing, for example, sends the world into slow-mo, letting you land several powerful hits before time starts up again. The range attack can be powered up by using it in detective-vision mode, letting you snipe enemies from an incredible distance with a deeply stretchy punch. As you take and receive damage the tension gauge fills in, up to three pips total, fueling three super-powered attacks that cause massive damage to anything they hit. It’s honestly not a bad variety of skills, but for the most part enemies aren’t particularly threatening so you end up doing the punch-punch-punch-punch routine until they’re gone, sometimes mixing it up with a well-timed dodge for a moment of bullet time just for the sake of variety. While the fighting isn’t particularly exciting it’s also not terrible if you remember to use the extra skills, and seeing as there’s a lot of fighting, it’s best to use some discipline in enforcing variety even if it’s not all that necessary. Enemies come in a small handful of types, with both pirate and Navy having near-identical lower tier fighters. A guy with a shotgun may look different between pirates and Navy but that doesn’t matter too much if they act the same and both go down in two hits. As you start seeing more advanced enemies the variety kicks in, and sometimes you’ll run across an extra-powerful version of a standard enemy who can soak up a huge amount of damage, but it isn’t until the Luffy’s rogues gallery starts descending on the island that his combat skills are put to any real kind of test. While the start of the story is focused on building the world, introducing the island and its inhabitants, the latter part of the game sees old friends and enemies show up, each with their own agenda. Smoker and Kashigi, Buggy the Clown, Law, Sabo, Crocodile and many more provide One Piece fan-service, and most of them are looking for a fight. They’re a welcome addition after a few too many hours of sword guy/rifle guy/shotgun guy/hammer guy, and while they aren’t particularly hard to defeat, they’re at least a different encounter from the usual popcorn enemies. 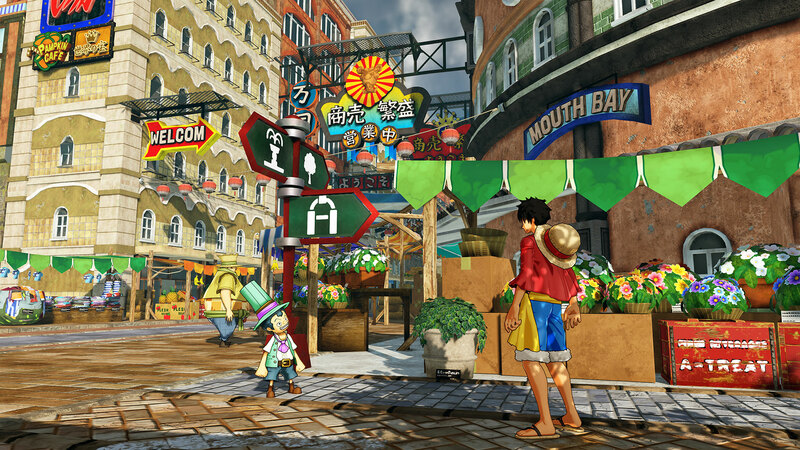 The problem with One Piece World Seeker is that for every positive there’s either a negative or a missing bit of polish. All those resources you gather, for example, are used for ship activities such as sending a crew member out to search for more resources or crafting an equipable item. Luffy can wear up to three accessories at once, enhancing his stats in different ways, and each item comes in common, scarce and rare formats. You earn blueprints for new items by completing missions, either the main story or the many side-quests that fill in background details, but it’s such a half-baked system I found three that seemed to get the job done called it good. When having Franky or Usopp create a new item the menu doesn’t tell you if you have one already or not, so unless you memorize your inventory you’ll be hopping between multiple screens to see what you need to create. Then, after building half a dozen of the item until you get a rare one for the best stat upgrade possible, comes the realization it’s not any better than what you’ve already got. That half-baked style is at its half-baked-est when it comes to stealth. Luffy is a character best known for being direct, like the mutant rubber love-child of a brass band and a tornado, so for some reason there are stealth missions in World Seeker. Not many, thankfully, but the stealth system is both fairly handy and completely senseless. The useful part is when you just don’t feel like fighting someone who’s in the way, so running up behind them and thumping them in the head with a Takedown attack (hit the square button when in range of an enemy who isn’t yet aware of your presence) lets you avoid combat. It’s actually somewhat enjoyable when unnecessary, because the worst thing that happens is all the soldiers in the area come running and are a mild nuisance for the minute or so it takes to defeat them. Stealth missions, on the other hand, are just a bad idea, ending instantly when a single enemy sees you and requiring an incredibly long reload. Thankfully stealth missions are rare and short, but deeply unwelcome when they arrive. Actually I’m going to take that back. The winner of the half-baked award isn’t the story but rather its presentation. While cutscenes are mercifully short, taking just long enough to get in a character bit or two and convey the necessary information before letting Luffy get down to business, almost every single one is conveyed by two or more people talking. There’s a rich backstory about Jeanne’s mother and her effect on the town, with Jeanne trying to live up to her mother’s peacekeeping legacy amidst a situation that’s getting more dangerous and divisive by the moment. There are missions involving gun smugglers, a sub-plot that becomes a main plot about Jail Island’s mining history and a slowly-growing realization that whatever is happening on the island is much bigger than it looks. All of which is conveyed by people standing around throwing dialogue at each other. It’s like the old Hollywood adage of “Tell, don’t show, because showing is expensive and who’s got that kind of budget?” There’s a lot going on at Jail Island, but if it doesn’t involve Luffy then you’ll only hear about it from other characters without even a comic book panel to illustrate the details. Despite all that One Piece World Seeker can’t do, it’s still a solid B game. The main problem feels like too much ambition in design, with a million good ideas brought short because they can’t be fully realized with only a couple that get to shine in full. When the world is open and adventure waiting in every direction, it’s a lot of fun to wander the map, chasing down chests and grabbing all the side-quests you can find. Sure, the quest may boil down to “Go here, fight some guys, find a thing, come back,” but each one also adds a bit of lore to the world, filling in background details and making Jail Island feel more alive than the small handful of people wandering the streets of its towns could manage by themselves. Combat may be repetitive, but it’s not actually bad, and every now and then a difficulty spike pops up to make you think about Luffy’s skills instead of merely button-mashing through each encounter. Once I wrapped my head around what the game is and accepted its shortcomings I had a good time putting Luffy through his paces in a story that just keeps getting bigger as the game progresses, rocketing around the island and not resting until every secret was found and plotline completed. 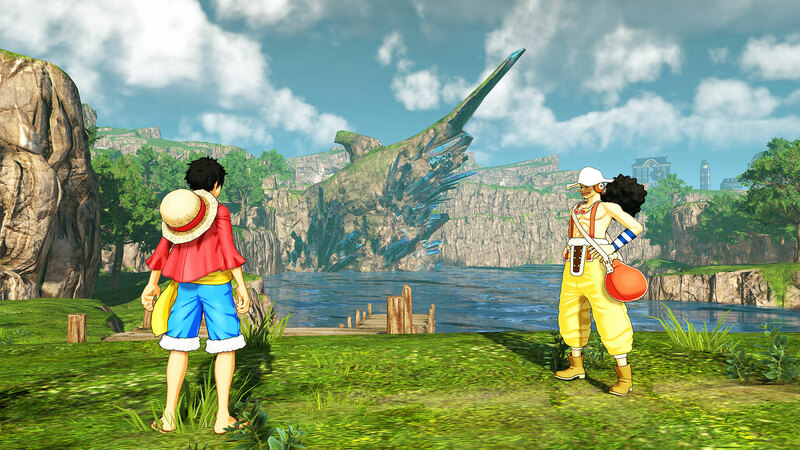 One Piece World Seeker may not be the game it wishes it was, but the thing it actually became is a perfect example of how much fun a mid-tier game can be if you approach it from a forgiving perspective.